Hanna was the lucky recipient of the RAB Special Award for 2017, a cheque for £1000. The RAB Trust makes this award each year to an outstanding student from a number who were invited to submit a proposal detailing how they would spend the money. As I was lucky enough to be awarded money towards attending an acoustic workshop I was able to attend the 2nd European Acoustic Training School for Violin Makers which took place in Ghent, Belgium April 2018. This year’s conference was hosted by ITEMM, University of Ghent and HoGhent. 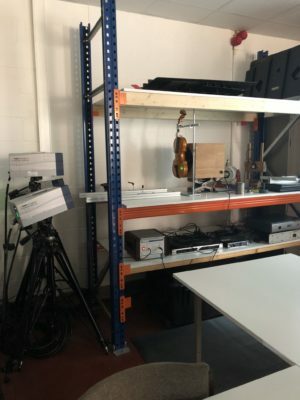 It was a packed four days of violin acoustics, experiments, listening test and cutting edge lectures by speakers such as Claudia Fritz, Romaine Vialla, George Stoppani, Colin Cough et al. 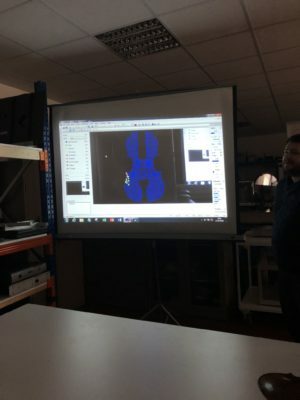 We even got to see a 3D Laser mapping of a violin taking place (see picture). It was my second time at this training school and I will most likely attend in future as it is great to feel how my understanding of how a violin works grows with each of these courses. So much has happened in the acoustic world since Hutchinson came up with the idea of plate tuning, our possibilities have grown so much and so it is even more important to understand the basics to be able to read the graphs that inside cavity, bridge mobility and radiation measurements throw at you. We listened to instruments which we also measured, and then compared thosemeasurements to what we heard. Also there were numerous occasions to talk about what is important to make a violin sound as well as the impact that wood has on sound. Of course there is no absolute truth, and on a violin there are so many things working together that it is really quite hard to isolate any of those features. But understand each and every one of them definitely helps in making better violins. And also it is good to see science finding its way gradually in the world of violin makers.